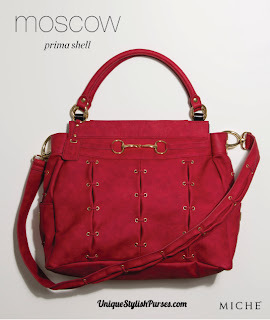 Suede faux leather is soft and luxurious to the touch, yet Moscow Prima Luxe Shell is bold red color is the true show-stopper! You’ll fall in love with her sophisticated styling featuring gold hardware and side pockets as well as rivet, link and lacing details. Comes with matching shoulder strap and short handles too. Strap length: 42.5”; width: 1.5”; strap drop: 18.5”. Handle length: 15.25”; width: .625”; handle drop: 6.25”.